Hail is a frozen rain pellet, which usually falls in showers from a cumulonimbus cloud. These frozen rain pellets can practically do a whole lot of damages to various parts of the car. The things that can be damaged by hail are metal, windows, paint, and more. However, there are ways to keep your car from hail damages. This article is made to provide you with four different ways to protect your car from hail. The hail proof car cover is required to make sure your car is well-protected from hail. Due to the great damages caused by hail, it is necessary to take some measure to avoid the damages. There are many smartphone weather apps desired to send notifications when severe weather is coming. It is necessary to ensure the notification is turned on, on your smartphone before driving out of your house. After receiving a notification about extreme winter weather, you can stay indoors; pack your car in a garage or others. These are some of the things you need to make sure your car is protected from the damages caused by hail. With damages caused by hail on the car, skylight or glass doors, it is necessary to beware of severe weather condition. When you discover extreme weather that can result in a storm, the best thing to do is to hide your car someone and take a cover. If you are driving on the road and hail starts to come down, pullover under a freeway overpass for cover. Make sure you only park on the other side of a building from where the wind is blowing. Driving in hail is a dangerous adventure, and you should not allow it to happen. Another way to protect your car from hail is to park in a safe place. Packing your car in an open outdoor space is not an option when there is an extreme weather condition resulting to hail fall. Packing in a garage is one of the best options to make as it is what you need to keep your car safe and protected. But, if you do not have a garage and storm is coming, you have to look around for a nearly by cover to protect your car from damage. If you do not have a carport, you have to build one. Ensure your car is parked under the carport for adequate protection. It is going to protect your car from a storm when there is hail. If hail is common in your area, you should get a good car cover. You can check on the automobile shop on the internet. Use a blanket and cover your car properly. You can also cover it with tarps if a cover is not available. There are a whole lot of reasons why you should go ahead and make use of Lanmodo car cover. This is a reliable car cover for hail that will assure sufficient protection of your car from hail damages. It is built with unique features that can assure protection of your car from damages. 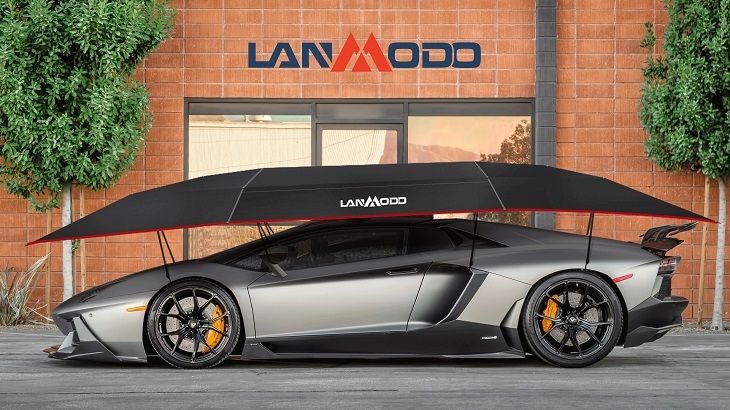 Lanmodo car cover is made with a fiberglass material strong enough to withstand the effect of hail on your car. Your car will be in good condition notwithstanding the severity of hail or storm when covered with Lanmodo. Another thing with Lanmodo hail proof car cover is that it is built with a good oxford cloth. This oxford cloth is quite durable and easy to wash with water. Removing stains will be easily done when you take advantage of the Lanmodo. In addition to the features associated with Lanmodo car cover is that it is quite portable and easy to set up. With the foldable and portable feature, you can easily fold and put in your trunk while on the go. This is to make sure that you protect your car anywhere you go at any point in time. How You Can Stay Cool in Your Car During Heat Wave? What Car Protection You Need to Do for Your Car During Spring? Why My Car Gets Scratched, What to Do About It? Sun Damage: Where to Find Shade for My Ford? Subscribe to latest products, news and exclusive offers. Copyright © lanmodo.com All Rights Reserved.